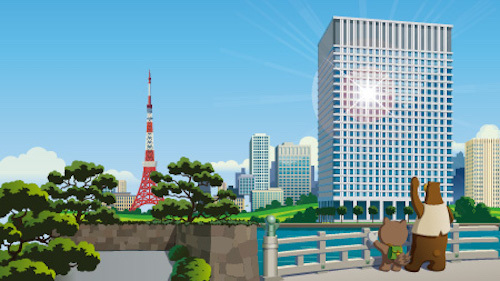 Salesforce’s mission as the global leader in customer relationship management (CRM) is to help companies connect with their customers in entirely new ways. Every organization in the world wants to better understand customer needs, solve their problems, and identify opportunities to help -- all by managing customer information and interactions on a single platform that’s always accessible from anywhere. To further this mission, today at Dreamforce, we are excited to announce a new strategic partnership with Google to deliver smarter, more collaborative experiences for customers. 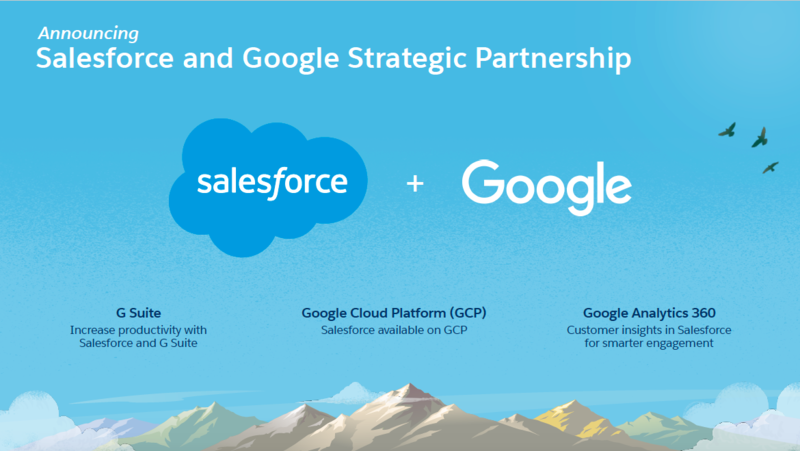 Specifically, this partnership will deliver new integrations that connect Salesforce with Google Analytics 360 and G Suite. Lets dive into the details. Delivering smarter marketing and customer engagement all starts with knowing your customers and prospects. 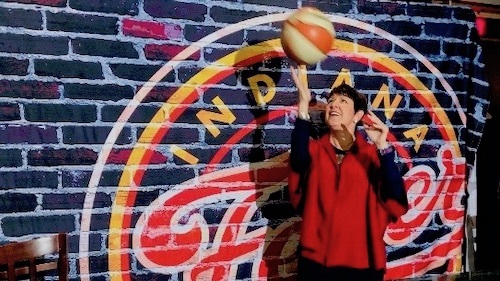 In order to do this, companies need to understand who a person is across all of their experiences with a brand, including ads, websites, apps, email, social, call centers, sales teams and more. With the new, and industry first, integration of Salesforce with Google Analytics 360, companies will be able to seamlessly connect sales, marketing and advertising data across Salesforce Sales Cloud, Salesforce Marketing Cloud and Google Analytics 360. This integration delivers complete consumer analytics to drive smarter engagement—from awareness all the way through to conversion and retention. 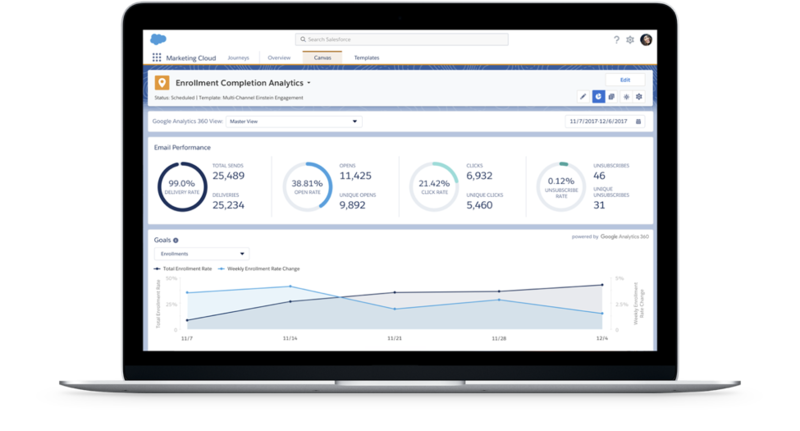 Audiences and campaign data from Analytics 360 available for activation in Marketing Cloud: For the first time, a marketer can create customized audiences in Analytics 360 and easily push them to Marketing Cloud for activation in direct marketing channels such as email and mobile. In addition, Analytics 360 data will be available directly within Marketing Cloud, delivering marketers one holistic dashboard of consumer engagement data. Sales data from Sales Cloud available in Analytics 360 for smarter ad targeting: By integrating Sales Cloud data into Analytics 360, marketers will gain new visibility into the sales cycle, enabling them to create richer audience segments and deliver smarter ad optimization. With this deep integration, advertisers can convert prospects into customers and find more new customers by leveraging Google’s ad platforms. Visit the Google Analytics blog to learn even more about this first of its kind integration. Customers will be able to surface powerful customer intelligence seamlessly between G Suite and Salesforce Lightning and Quip. Additionally, to enable Salesforce customers to quickly realize the productivity gains made possible by bringing together these solutions, Google is offering eligible Salesforce customers that are new to Google's growing productivity and collaboration services will be able to use G Suite at no charge for up to one year (restrictions apply, see here). 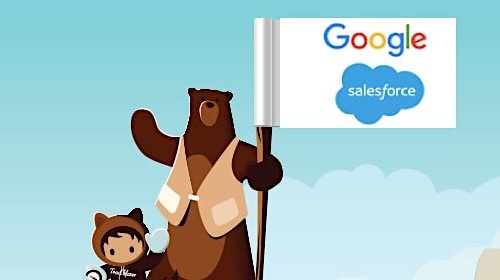 Finally, as part of the agreement, Google will continue to use Salesforce as its preferred CRM provider to engage with its cloud customers in new and meaningful ways, while Salesforce will continue to use G Suite as its preferred email and productivity partner. Also, Salesforce has named Google Cloud as a preferred public cloud provider to support the company’s rapidly growing global customer base. Salesforce plans to use Google Cloud Platform for its core services as part of the company’s international infrastructure expansion. Read the FAQ below or visit our partnership website to learn more and sign-up to get these new features deployed at your company. The partnership is made up of three components. As part of the agreement, Salesforce has named Google Cloud as a preferred public cloud provider to support the company’s rapidly growing global customer base. Salesforce plans to use Google Cloud Platform for its core services as part of the company’s international infrastructure expansion. The companies will offer new integrations that connect Salesforce, the world’s #1 CRM platform, with G Suite, Google's transformative productivity and team collaboration services, enabling customers to surface powerful customer intelligence seamlessly between Salesforce Lightning and Quip and Gmail, Hangouts Meet, Google Calendar, Drive, Docs and Sheets. To enable Salesforce’s more than 150,000 customers to quickly and easily realize the productivity gains made possible by bringing together these solutions, eligible Salesforce customers that are new to Google's growing productivity and collaboration services will be able to use G Suite at no charge for up to one year (restrictions apply, see here). The companies will also deeply integrate Salesforce with Google Analytics, seamlessly connecting sales, marketing and advertising data across Salesforce Sales Cloud, Salesforce Marketing Cloud and Google Analytics 360, for the first time. Customers will be able to gain new consumer insights so they can deliver the most relevant experience at the right moment—whether that’s talking to a sales person, opening an email, visiting a website, clicking an ad, or searching on Google. Why is it great for customers? This new strategic partnership with Google will enable smarter, more collaborative experiences for customers. Customers will be able to surface powerful customer intelligence seamlessly between G Suite, which is already being used by more than 3.5 million businesses globally, and Salesforce Lightning and Quip, which are redefining CRM for the Fortune 500. And with the Salesforce integration with Google Analytics 360, the first time Google Analytics has integrated with a third party, customers will have incredible insights to deliver the most relevant experience at the right moment. When will these Google and Salesforce integrations be available? Several integrations between G Suite and Salesforce are already in market, including Salesforce Lightning for Gmail, and integrations with Calendar and Google Drive. Deeper integrations are expected to start rolling out in 2018. The Quip Live Apps integration with Google Drive is expected to be generally available in the first half of 2018 with any Quip Enterprise License, for $25 per user, per month. Qualified Salesforce customers receive G Suite for up to one year at no additional cost. This promotion from Google is available to Salesforce customers—restrictions apply, more details can be found here. The integrations between Salesforce and Google Analytics 360 are expected to begin to arrive in the first half of 2018. Does every Salesforce customer get the G Suite offer from Google? Google is offering this exclusively to eligible Salesforce customers. Companies with 350 employees or more will get G Suite for 1 year at no cost. Companies with less than 350 employees will get G Suite for 3 months at no cost. If the Salesforce customer already uses G Suite, they should reach out to their G Suite rep for additional promotions. Eligible customers include Sales Cloud, Service Cloud, Platform and Quip. How do I get the G Suite Promotion? 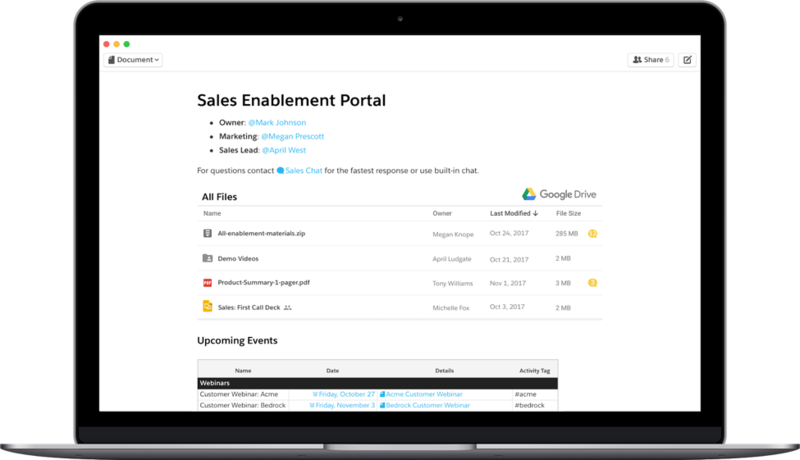 New customers can have the G Suite Promotion added to their Order/Quote by their Salesforce Account Executive (AE). Existing customers can visit salesforce.com/google and follow the links to sign up for the trial. What is Salesforce’s infrastructure strategy? Our focus is on delivering the most trusted, reliable and resilient infrastructure available and we do that with a multi-vendor approach. AWS is a great partner. Google is a great partner. We'll continue to work with a variety of infrastructure technology vendors and partners across its own data centers, as well as new public cloud-based data centers, in order to deliver the best service possible to customers. Yes, Salesforce will continue to invest in its own data centers. Additionally, Salesforce expects to utilize Google in select international markets to help bring new infrastructure online more quickly and efficiently.